The Children’s Choir was established a few months ago and involves children from the three refugee camps targeted by the project (Jalazon, Qalandia and Al Amari) who are keen to sing and perform together. Directed by Iyad Stati and accompanied by several musicians from Al Kamandjati, the choir rehearses once a week in al Am’ari refugee camp’ Child Club. 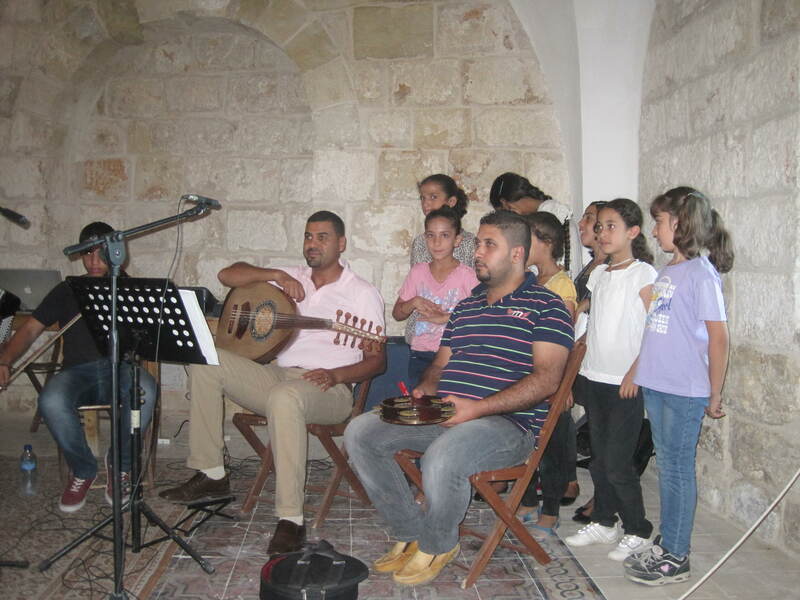 The choir’s debut event involved a recording in September of four Arabic songs (‘A al-Ruzana, Ah ya Zayn, Enti Baladna and Hala lala layya) by 15 children aged 8 to 15. These will be included in the CD containing a collection of traditional Arabic, French and Italian songs to be distributed in schools of the three countries involved in the project network. The children’s choir also performed on December 1st at the Palestinian Medical Relief Society Auditorium in Ramallah during the presentation of the toolkit on ‘Music Promoting Learning” developed through the project. The next opportunity to hear the children’s choir will be on January 26th, at Ramallah Cultural Palace during the final event celebrating the conclusion of the ‘Music Bridges West Bank, Italy and France’ project. A total of 90 hours per week of after school music classes are taught to children in Jalazon, Ammari and Qalandia child clubs. Since the beginning of the project there have been over 280 child participants in these after school activities. Each child receives half an hour of private instrumental lessons and another half hour of theory and solfege classes. They are given a musical instrument for free to practice with at home. The piano students practice at the child clubs on brand new beautiful upright Yamahas that were purchased for each club. 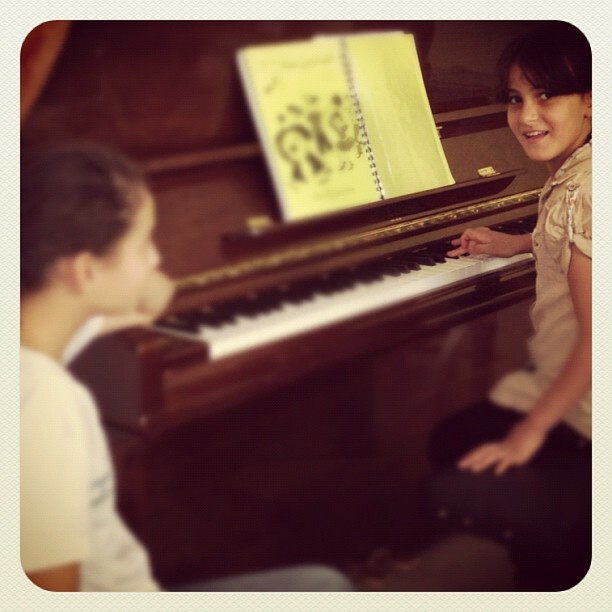 Carmen and Diana practice and play for each other on the piano at Jalazon child club. Once a week in Ammari Iyad Staiti gives the children from all three camps a choir session. We also hold children’s concerts for the community. 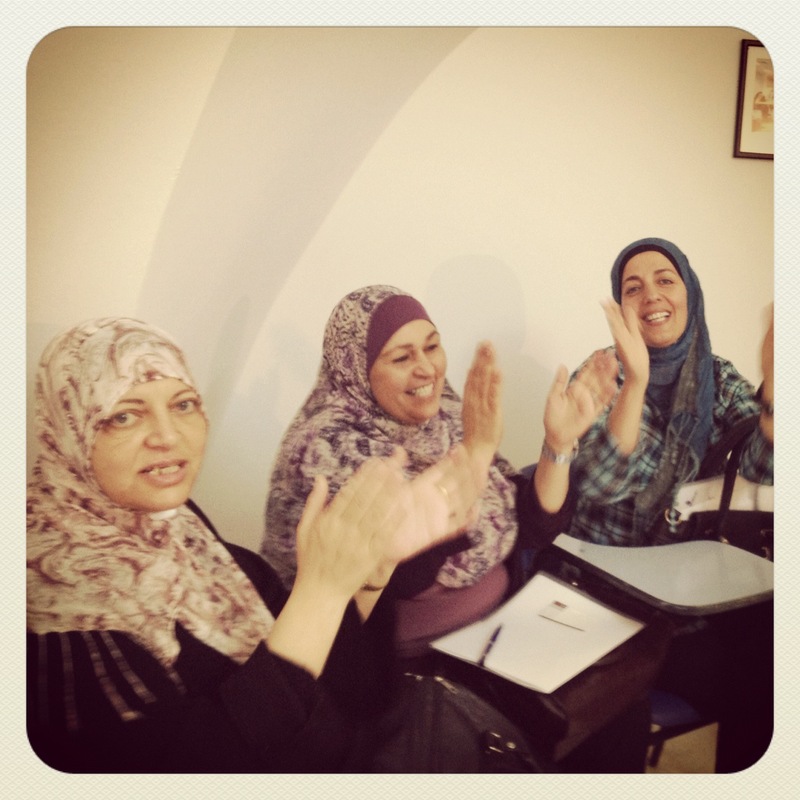 This Saturday’s workshop with the UNRWA school teachers was a great success. It was the second workshop in a series of three taking place throughout the fall for the training of teachers in music appreciation classes. The aim of the training is to provide them with both theoretical and practical music skills in order to help them further promote music education in the classroom. By the end of the training, teachers should be able to teach basic music appreciation classes to their students on their own and without the aid of Al Kamandjati teachers. The teachers were divided into two groups. The first group worked with Ibrahim Froukh and Khaled Arameen on rhythm exercise such as body percussion and movement. The second group worked with Donia Jarrar and Robin Burlton on singing and notation. After the first group was done with the rhythm portion of the workshop they switched with the singing and notation group. Teachers were given a lesson on note naming in the same way that a beginner children’s class would. Donia assigned different pictures to the notes to help the teachers memorize them and explained the difference between stepwise motion and leaps on the musical staff. Robin worked with the teachers on singing and pitch memory through the use of the lullaby Brother John. 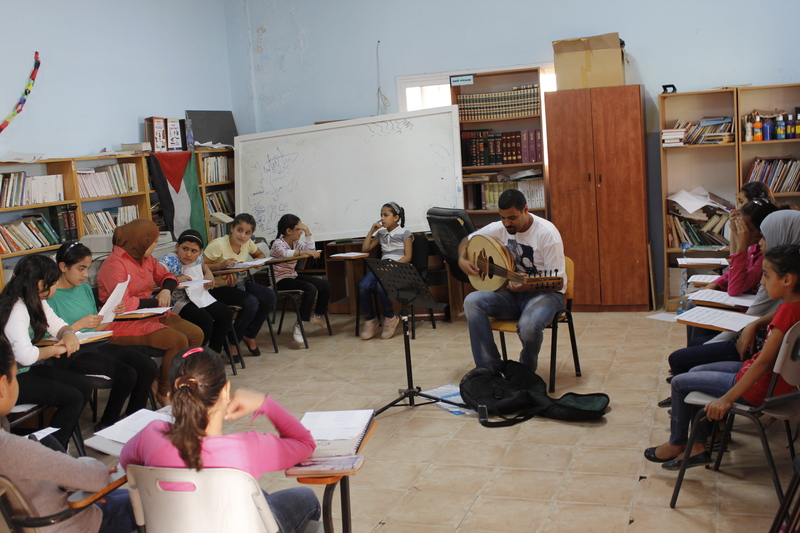 By the end of the session, teachers were able to read a popular Palestinian folk song in solfege. The next workshop, “How to Plan & Deliver a Lesson” is scheduled for November 10th. Until then, stay tuned for more pictures and video from lessons and classes this week. A great start to the Fall! The year’s music appreciation classes in the UNRWA schools in Qalandia, Jalazon and Al Amari began this week, and Ibrahim and Freya have been teaching the children basic body percussion techniques in order to explore co-ordination and rhythm. In addition they have been introducing the flute recorder as an instrument in class and been exploring group pitch and rhythm games, such as having half the class clap beats 1 and 2 of a bar, and the other half play beats 3 and 4 as notes on recorder. They also looked at dynamics; a miscellany of animals including cats, dogs, lions, tortoises, mice, gazelles and cows have been imitated over the past few days to demonstrate differences in speed, pitch and volume! In Iyad’s Sunday session the use of the oud had a significant effect on the group listening skills; the children loved listening to him play so much that they remained completely still – transfixed by the music – for a good few minutes, which is close to a miracle when it comes to 6 year olds! They also enjoyed imitating pitches on the oud by singing and copying rhythms by clapping. Below is a video of me leading Ms. Suzanne’s class of 3rd graders at Qalandiah girls school in a dynamics exercise. I like to start each lesson with this exercise as it gives the girls a good amount of energy and then I pick one girl a week to come up to the front of the classroom and conduct with me. 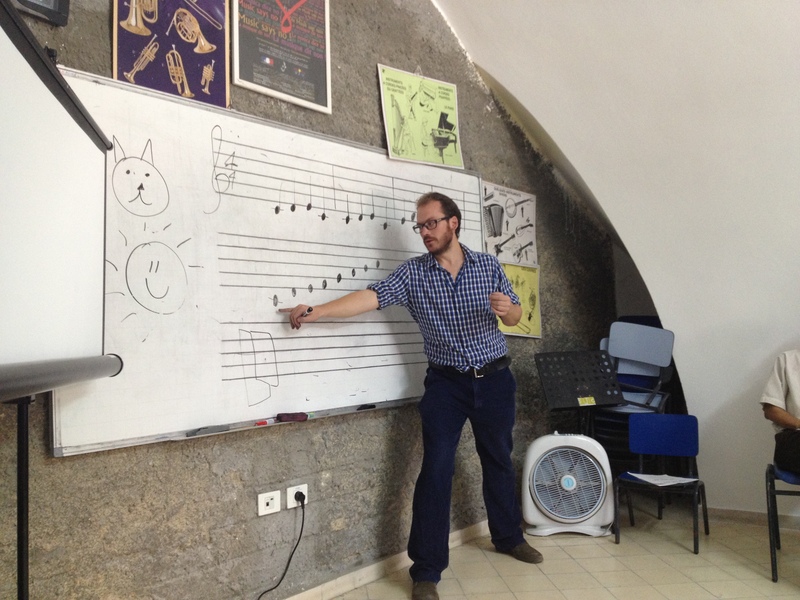 We are a group of wonderful and enthusiastic music educators that work as teachers at Al-Kamandjati in Ramallah teaching music appreciation classes in Palestinian refugee camps. 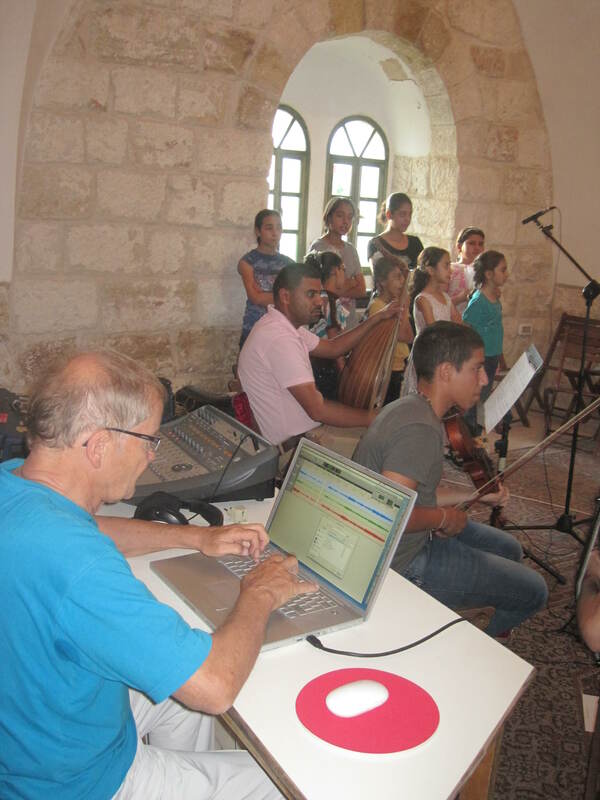 The project we are working on, “Music bridges West Bank, Italy and France” has been implemented by the Terre Des Hommes Foundation and aims to provide music awareness and educational access to thousands of children from the Jalazone, Qalandia and Ammari camps. We are currently teaching a total of forty one-hour long music classes per week at both the boys and girls UNRWA schools for grades 1 through 3. Learning music helps children cultivate many skills that they can use throughout their entire adult life. Researchers have found a significant relationship between music education and positive performances in reading comprehension, spelling, math, listening skills, primary mental abilities (verbal, perceptual, numeric, spatial), social skills and motor skills. 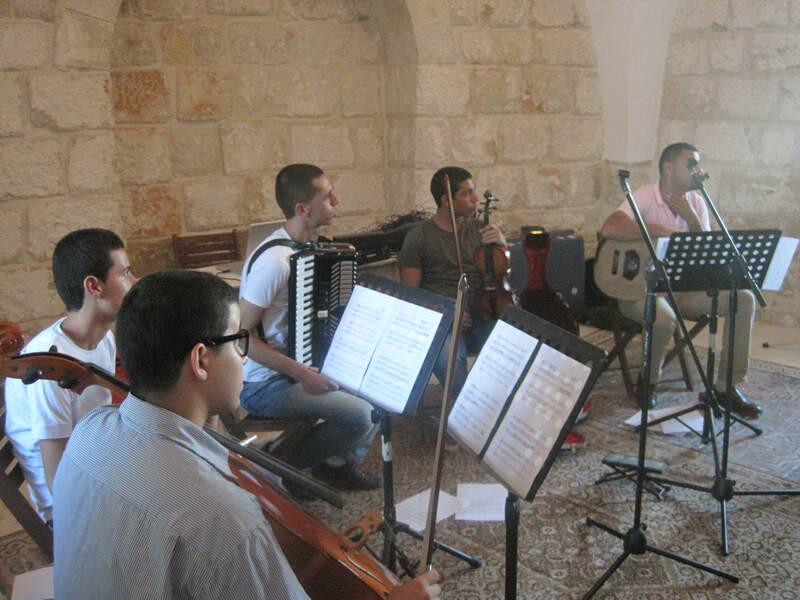 Up to date structured music education has rarely entered the Palestinian refugee camps and children have never had the possibility of studying it or enjoying it in an attentive way. Through this blog, we hope to share our work and our experiences with the children in the camps, as well as our teaching methodologies and tool kit that we will be developing throughout the upcoming months. 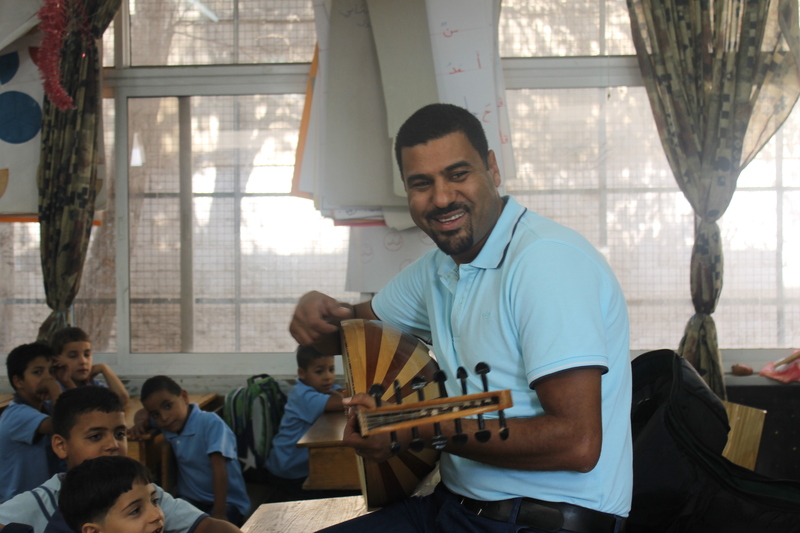 We have also begun workshops with the UNRWA teachers at Ammari camp so that they may begin to utilize music in the classroom to help with critical thinking skills in other subjects. More to come on that, pictures and video in the upcoming week!